Dessert is often regarded as the ‘coup de grâce’ of any meal experience. It allows for an already satisfying meal to be capped off with a decadent tongue raising flourish. It is also the one part of the meal experience that is enjoyed no matter how much is served and consumed during the main course. Hence why a croissant pudding sounds so delicious! The Orange Marmalade Croissant Pudding is bore from my family’s culinary curiosity and ever present sweet-toothed cravings. It is easy to prepare and can, thankfully, be baked on a whim. 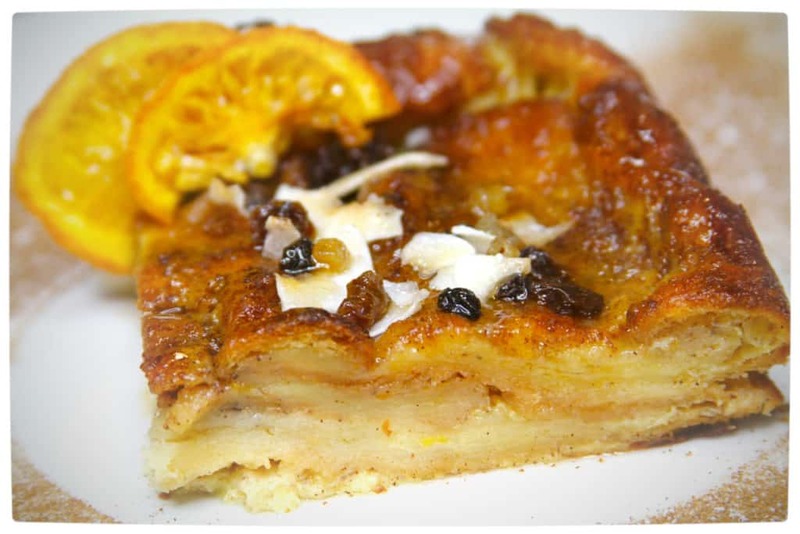 Coincidentally, the Orange Marmalade Croissant Pudding is also perfectly suited to the festive season because it contains all of the spices that are directly associated with traditional Christmas dishes. 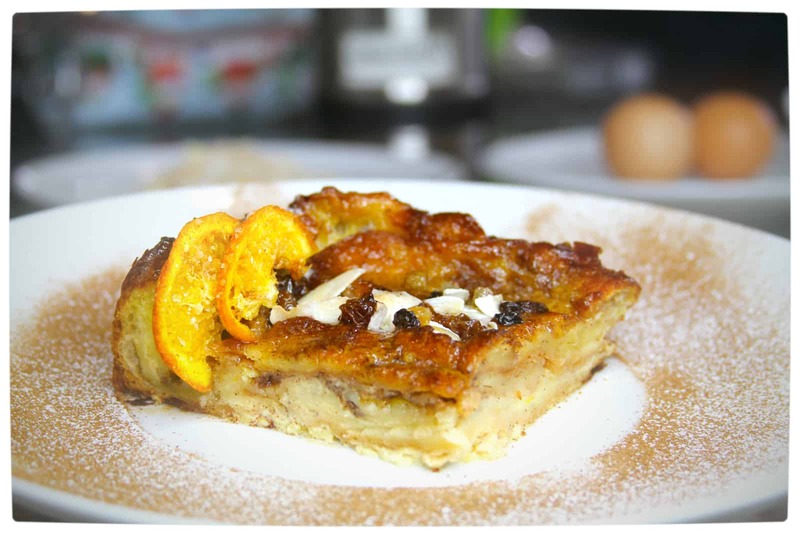 Each bite of the Orange Marmalade Croissant Pudding bursts with house warming aromas and palate tingling flavours; all of which are provided by spicy cinnamon, velvety vanilla, hints of nutmeg and the sweet, yet subtle, undercurrent of the wonderful orange marmalade. The result is a divinely festive citrus infused spice blend that is heaven to smell and sinfully good to eat. 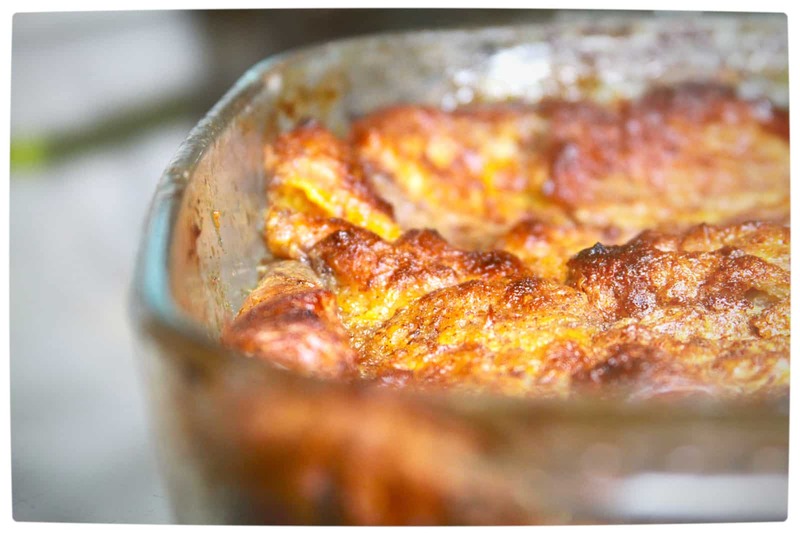 Although made like a traditional bread pudding, the Orange Marmalade Croissant Pudding has a much lighter and more pleasant texture because of the pastry roots of the croissant. As a result, seconds or even third helpings of this delicious dessert can be had without complaint. 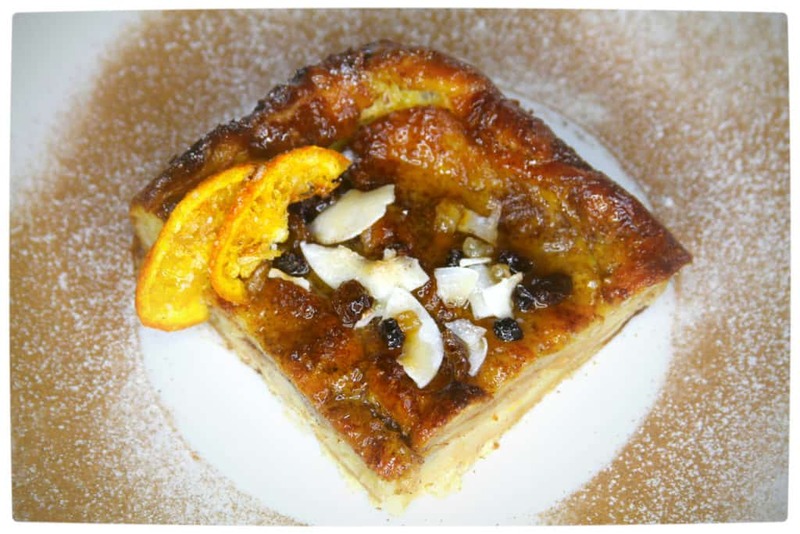 The Orange Marmalade Croissant Pudding is a satisfying dessert for any occasion and is best served with a tot of your favourite port. The dessert is also versatile enough to be served either fresh from the oven with ice-cream or directly from the fridge with a warm maple syrup and cream glaze. 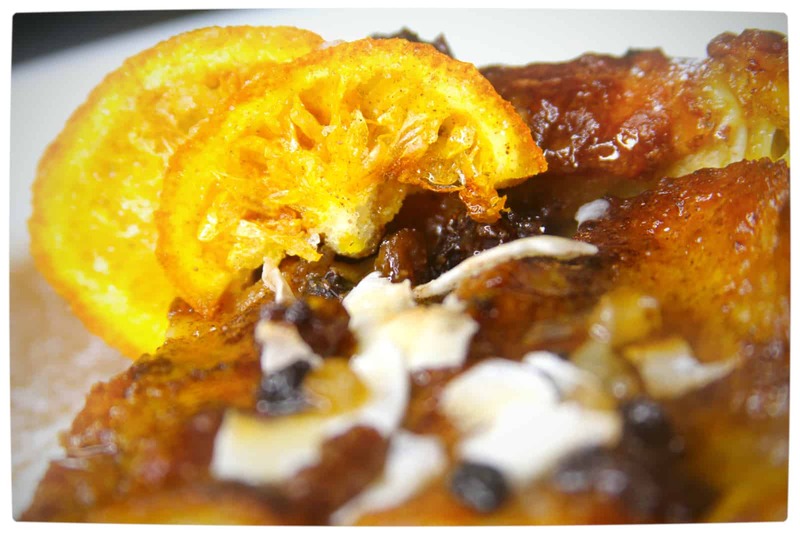 The Orange Marmalade Croissant Pudding is a festive filled dish that can be enjoyed at any time of the year. It is a dish that arouses fond and delicious festive memories all whilst being fairly easy to prepare – should take around 40 minutes or less to make (hit the green button below for the list of ingredients and the recipe). 6 x Plain butter croissants. Pack of natural cinnamon sticks. Pack of ground Nutmeg spice. Pack of ground white/brown Sugar. Generously butter the oven dish. Gently slice open all of the croissant into halves. Lavishly spread butter and orange marmalade onto the croissant halves. Place the prepared croissant halves into the oven dish – prepared side up, croissant may overlap. Optional (as per your taste): sprinkle raisins/sultanas/nuts over the prepared dish. In a separate bowl, mix together the cream, milk and two cinnamon sticks. Warm mixture on stove. Remove before boiling. Allow milk, cream and cinnamon mixture to cool. 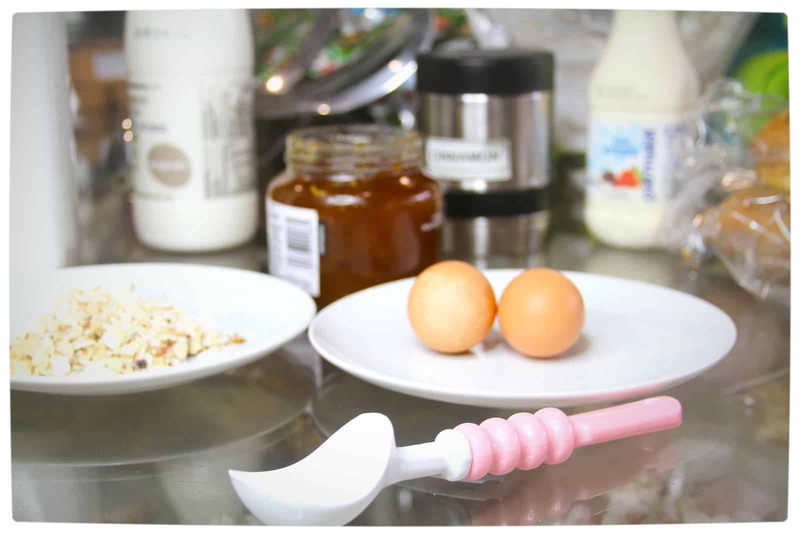 Once cooled, add two well beaten eggs and two teaspoons of vanilla essence. Stir adequately. Remove cinnamon sticks and pour creamy mixture over the prepared croissant. Allow the entire prepared dish to soak for at least 15 minutes. Once sufficiently soaked, bake the dish in an oven at 180 C/356 F for 20 – 30 minutes or until set. Dish may be enjoyed warm or cold. Serve with a dollop of cream or ice-cream, a slice of crystallised orange, a pinch of almond flakes and a dash of cinnamon and sugar.